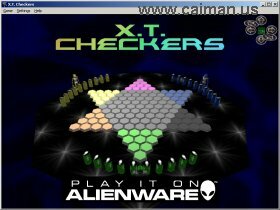 Caiman free games: XT Checkers by David Carraher. 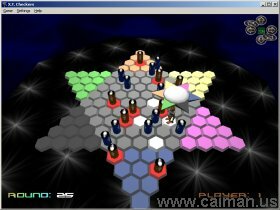 Based on the classic board game known as "Chinese Checkers", X.T. Checkers is a game of strategy, planning, and visualization. Playing a good game of X.T. Checkers requires the ability to look ahead, and see where pieces are going to be in future moves. X.T. Checkers uses the basic moves of checkers (move and jump) combined with the need for speed - it's a race to see who can get his Alien pieces across the board first! 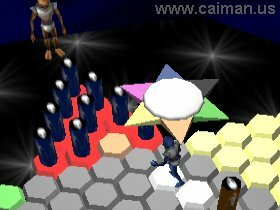 - Alien Enhanced: a 3D board! 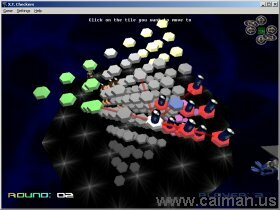 The game is very nice, has many options, fun animations and the AI is beatable. The sound is good, but after a while it's boring.